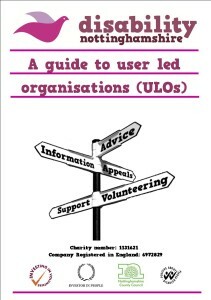 We have produced a concise, informative and easy to read guide for individuals and organisations to learn more about the types of things a user led organisation does. It also gives excellent hints and tips on how to become more user led and the typical challenges people may face on that journey. It has been put together after extensive consultation with our users, members, volunteers and other voluntary community charitable groups in Nottinghamshire. We hope you enjoy it but if you have any questions, comments or would like to talk more about our user led work then please contact us.